Yesterday was my friend Matthew's birthday and he said he wanted cookies, with chocolate chips, and cinnamon. Not too terribly difficult a request except I have been a whirling dervish all week and waited until the last possible minute to make them. Since I didn't have time (or patience!) 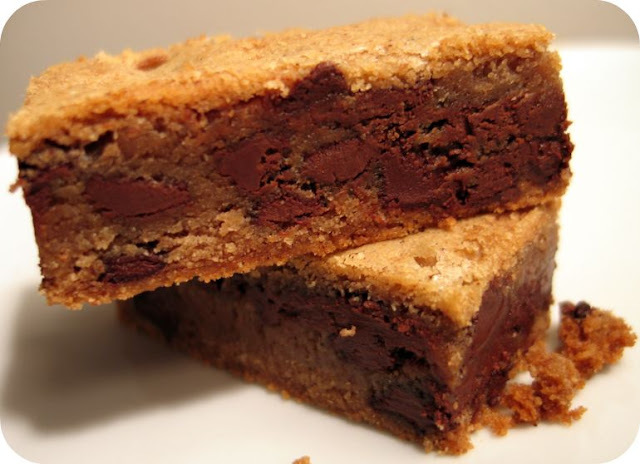 to make 7 or 8 dozen cookies, I opted for a short cut and made bars instead. He was very pleased with my newest invention and didn't feel cheated at all. In fact, I think he might have liked them better! This recipe uses a trick that I learned from Ina Garten. 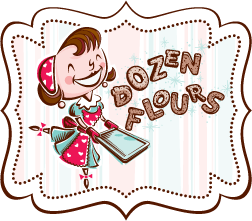 When you're making a bar, cake, or cupcake that has chocolate chips or other ingredients suspended in the batter, sometimes you'll find that all the tasty tidbits sink to the bottom of the batter/dough. To help mitigate that, give the chips a fine dusting of flour before you add them to the batter. This creates a little air pocket around each chip and helps to keep them in place while the batter around it bakes. 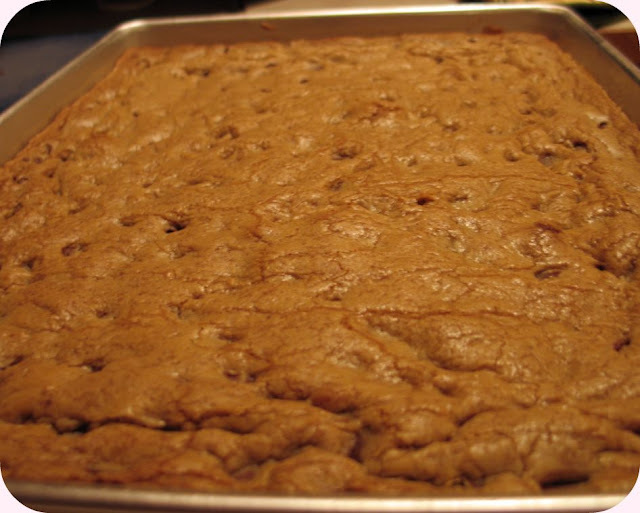 For this recipe, just for fun, I added a little extra cinnamon to add to the overall flavor of the cookie. Yield: I cut them into 1 1/2 x 1 1/2 inch chucks and 1x3 inch dunking-bars and got a ton (I'd say roughly 60 servings). Your results will vary depending on the size pan you use and how big you decide to cut them. Preheat the over to 375F. Grease and flour (I use Pam with Flour) either one half-sheet pan or 2 13x9 pans. 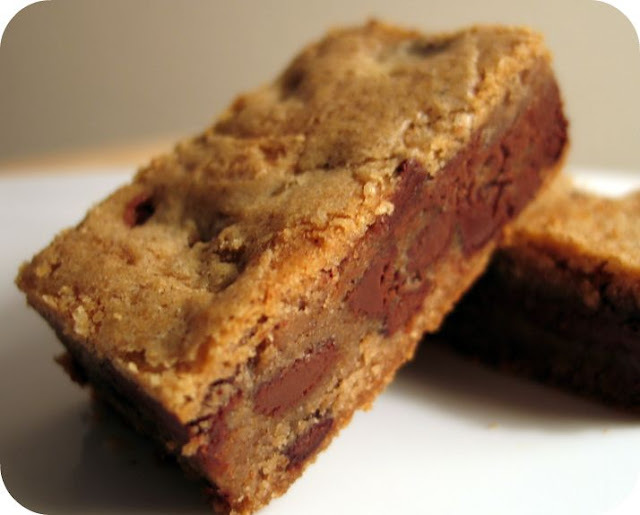 Combine all the chocolate chip/chunks and sprinkle 2 tablespoons of flour and a shake or two of cinnamon. Use your hand to coat the chocolate chips and set aside. In a large mixing bowl, cream butter and both sugars together until well combined, about 2 minutes. Add eggs (all at once) and the vanilla and beat for 1 minute on medium until thick and well combined (be sure to stop and scrape down the bowl a few times if necessary). In a small bowl, whisk together flour, cinnamon, baking soda, and salt; gradually add to creamed mixture, mixing well each time (the batter will be very thick and the flour will get trapped in the pockets). Use your hands to add the chocolate, trying to avoid the handful of cinnamon flour that's sitting at the bottom of the bowl. 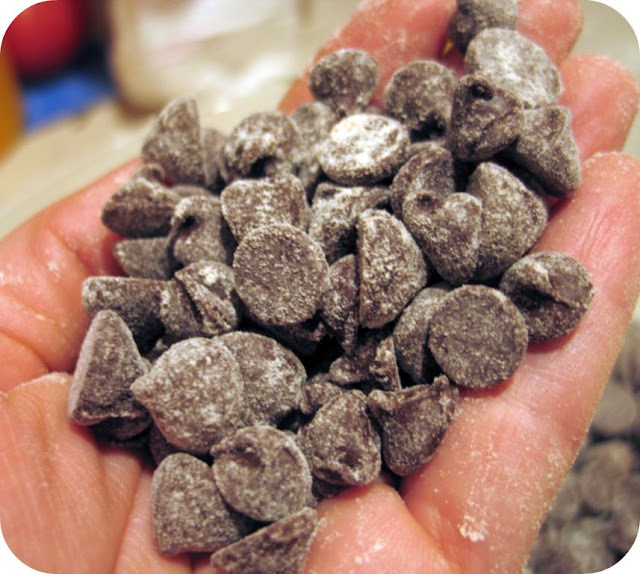 Using a mixer or your hand, blend it for a few second until the chocolate is well distributed into the batter. Press the batter into the prepared pan. Bake the half-sheet pan for 15 minutes, remove the pan from the oven and bang it on the counter to force the air out of the batter. Put the pan back into the oven and continue cooking until the center passes the toothpick test. I kept checking it every 3-5 minutes. DO NOT OVER COOK! 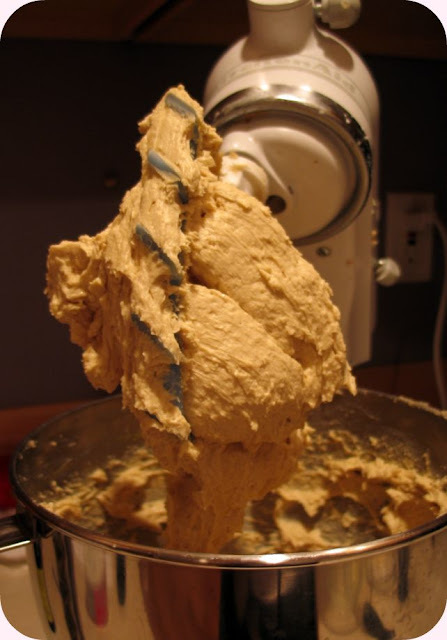 The dough along the perimeter will cook and brown faster than the middle and that's okay. You want the center to be just at the point where they are done, so it might look like they are slightly under cooked. For the half-sheet pan, they were done after 30 minutes. For the 9x13 pan, check the bang the pan after 10 minutes and continue cooking until done, checking on it every 3-5 minutes. (If anyone out there makes these in a 9x13 pan, please let me know how long it took to cook them so I can update the recipe). When they are done, remove from the oven and bang the pan on the counter again. Use a knife to cut around the perimeter of the pan (just to loosen the bars ), and leave 'em alone for a while. When the pan is cool enough to touch, invert onto a cooling rack (they will be upside down), then invert them again onto another cooling rack or onto a big cutting board. Let them sit until totally cool (I gave them 8 hours). Cut into the desired shape and size. Would I Make This Again? Yep! These got lots of "oohs" and "ahhs". I think these could do well for lunch box treats or for a bake sale. Shoot, I could even see these sold in a fancy coffee shop. They kept their shape well and defiantly scored high in dunkability. I work in the office next door to Matthew, and I got a chance to try one of these cookies. MOST delicious! Kudos! And, thank you! You let them cool for 8 hours? Holy cow! At my house as soon as it comes out of the oven it's fair game. I'm probaby the worse....I can't tell you how many times I've burnt my mouth or ruined the look of something because I didn't let it cool long enough! The bars look and sound great. Happy birthday to your Matthew! Urn - thank you! I'm glad you enjoyed it! Hey Ingrid!Here's the thing, I've noticed that baked good actually improve with age. Some of the things I've made will go from tasting okay or merely good to outstanding overnight or even as much as two days later. Since I do most of my baking the night before (I usually finish baking around 10pm) it's easy for me or my family (since they are usually in bed) for it to just sit out overnight. Crazy, huh? But seriously, these cookies were totally yummy once they cooled down, but they were just easier to cut and just tasted better after waiting overnight. They look dense in a great kind of way! happy b'day to your husband! I adore cinnamon and you just made me crave chocolate chip cookies with cinnamon in it. I'll have to add it next time I make them! Chocolate and cinnamon.. =) I've got to try these ones! I was glad these were bars instead of cookies. Julia wanted to drizzle even more chocolate over the top, but the amount of chocolate was just right; more would have been too much. As with many things that have chocolate chips, these were good right out of the oven with the chocolate all melty; but they were even better after a few hours of cooling, when the chocolate had a chance to solidify into the texture we all know and love. All in all, a yummy diversion from the fact that I'm another year older. Thanks Julia! Wow, these are bars to fall in love with! They look amazingly good! These rocked! I included some peanut butter chips in them and just love them. This looks like what I've been searching for! Does anyone have experience cooking the 9x13 size as far as bake time? Hi Anony -- I bet these would be done somewhere around 15-18 minutes. I'd set the timer for 12 and just keep checking every 2 minutes or so. These are amazing! I made them for something I help out with every week, and they were all gone by the end! Not even one left.